Bahrain Refugee And Soccer Player Hakeem al-Araibi Gets Australian Citizenship He fled his native country of Bahrain after being imprisoned. Then he was jailed in Thailand and faced extradition charges. Australian Prime Minister Scott Morrison called him "our newest Australian." Australian Prime Minister Scott Morrison fastens an Australian flag pin on Hakeem al-Araibi, a Bahraini refugee soccer player who was granted citizenship in the country on Tuesday in Melbourne. 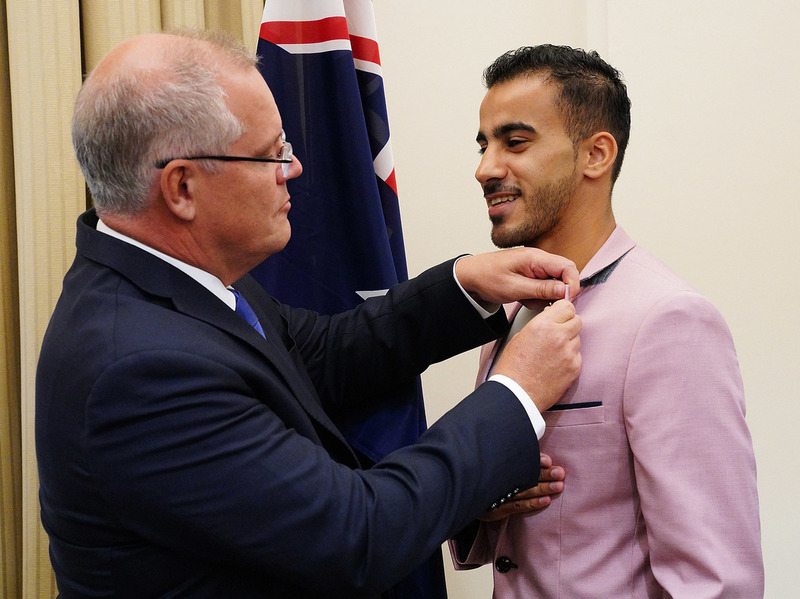 Prime Minister Scott Morrison fastened his own Australia flag pin to Araibi's jacket. "I'll take the new one," he said. "But this is for you, which you can wear very proudly, as our newest Australian but as someone whose Australian values have always been deep in his heart." The developments in Araibi's life triggered outcry among human rights activists, sports enthusiasts and lawmakers across the globe. Araibi used to play on the national soccer team in the small Persian Gulf state of Bahrain. In 2012, authorities arrested him. In 2014, a court convicted him in absentia of torching a police station, handing him a prison sentence of 10 years. The professional soccer player fled Bahrain that year. He had been living in Australia as a refugee until last November, when he landed in Thailand during his honeymoon. Thai officials arrested him on an Interpol red notice. He spent two months in jail, facing extradition to Bahrain. "I could still remember the tone in Hakeem's voice," Sayed Ahmed Alwadaei, the director of advocacy for the London-based Bahrain Institute for Rights and Democracy, tells NPR. "He was telling me about his sleepless nights, like it was a film running back in his head. Remembering everything in detail about how he was abused in Bahrain detention." Araibi was beaten, especially on his legs and feet just to remind him that he would not play soccer again, Alwadaei says. He says video footage showed that Araibi was playing in a televised soccer match when the alleged vandalism occurred. Inside Bangkok Remand Prison, Araibi told The Guardian that "Bahrain wants me back to punish me" for speaking publicly about human rights abuses and discrimination against Shia Muslims by Sunni leaders. Under international pressure, Thai prosecutors dropped the case in February and Araibi was released from a Bangkok prison cell. Bahrain withdrew its extradition request but on the same day, the minister of foreign affairs gave the ambassador of Australia to Bahrain a memorandum with the international arrest warrant issued against Araibi. On Tuesday, the soccer player announced that he finally felt safe. "No one can follow me now," he tweeted. In attendance at the ceremony was Craig Foster, an Australian sports analyst and retired soccer player who worked tirelessly to raise awareness of Araibi's case. "May we learn from the experience as a nation, treat every asylum seeker as supportively, with corresponding compassion as Hakeem. All deserve equal dignity, opportunity," he said. Australian Minister for Foreign Affairs Marise Payne told a crowd from the podium about the widespread concern for Araibi's welfare. Public support "played an enormous part in ensuring he was returned to Australia," she said. His soccer club, Pascoe Vale, described Tuesday's event as "a moment we all have been waiting for." It added that his example showed how soccer can break down barriers and unite people. Araibi is currently training and trying to regain the strength he lost while away from soccer, according to The Guardian. Alwadaei says Tuesday's joy only goes so far. "Although someone managed to escape the torture doesn't mean that their family members will be immune from consequences from the government," he says. Araibi's brother, who was imprisoned on the same charges, remains behind bars, Alwadaei says. He adds that many more political prisoners are languishing in Bahrain. "Although Hakeem got unprecedented support from the international community simply for his affiliation with [soccer]," he says, "there are thousands of other individuals who simply have no one to advocate on their behalf simply because they don't happen to be a famous athlete or to have the community behind them."